K100-forum.com » Technical, repair and troubleshooting » Electrical » Sidelight failure. While out riding the bike stalled, as I restarted the sidelights and instrument lights went off. I checked the fuses and they are fine, the lights came on as it switches through the ignition. The headlight still works. The righthand switch has been modified by the previous owner, the passing light switch on the left does not work, so the shop put in a bypass from the righthand switch. I need to repair the switch but need pointers as to where to start. @Stumpy wrote: While out riding the bike stalled, as I restarted the sidelights and instrument lights went off. I checked the fuses and they are fine, the lights came on as it switches through the ignition. The headlight still works. Hi Stumpy, sorry but I'm bit confused by your description of your problem - a bit more explanation might clarify things. Firstly - your first part sounds just like the load shed relay is doing its job. With the ignition on and lights turned on, when you press the start button, the load shed relay is designed to cut non essential battery load to ensure that there is enough power going to the starter. You will notice that the lights temporarily go out as this happens. With the engine running, the lights come back on again. Secondly - the right hand switch and passing lights issue. By passing lights I presume you are talking about the left and right indicators? The right indicator and indicator cancel buttons are part of the right hand handlebar switch unit - this unit also has the on/off switch for the parking light (otherwise known as side light), starter button and headlight switch. The left indicator is part of the left hand handlebar switch unit - this unit also has the horn press and the headlight full beam switch. How has the "shop" wired up the left indicator from the right switch? If your left indicator is not working from the left handle bar switch unit, the most likely cause is a build up of corrosion on the switch contacts. I have just cleaned up my right hand one which was becoming temperamental and now it is working as good as new again. A single philips head screw holds each switch unit onto the handlebar unit (with throttle & front brake lever on right and clutch lever on the left one). These screws can be a pain to remove as the head is easily stripped. However, once the screw is removed, the switch lifts easily away and you have access to a number of small screws. You probably will need to cut a couple of the zip ties securing the switch cables to the handlebars in order to give yourself enough slack to work on the switch. Top tip - position a shoe box under the switch unit and make careful note of which screws go where. There are several small parts and springs inside the switch unit which will make a bid for freedom, if you let them. This might be the cause of the original bodge? By removing the small screw (I think there are about 8 of them in the right hand switch), you can get at the switch contacts and clean them up with some fine emery paper and electrical contact cleaner (DeOxit gets good press). It is a bit fiddly, but doesn't take a great deal of skill or knowledge, provided you are methodical. If something doesn't move, there is probably a hidden screw that you haven't spotted. Of course, your success will very much depend on how the "shop" bodged the switches in the first place. You might have to buy replacement switches (eBay or the usual UK BMW spares outlets like James Sherlock, Motorworks and Motobins) - this is a bit more of a chore as it is a tank off job to access the switch connectors plugs underneath. The right hand switch has two wires added that go to a toggle switch and flash the high beam. The left hand switch works to switch to high beam but when pushed down not the highbeam flasher. I replaced the left switch with a spare, the high beam switch works properly with the flash/ pass light but no indicator switch working. The second switch I have works the indicator and the high beam, switch up but the flash / switch down does not work. I have two right hand switches, one need the plug changed, and two left hand switches. I just wonder if the load shed relay is at fault or if the switch has failed. I have fixed all the other things that needed doing, this is the last problem, I believe then the bike will be working properly. Rather than split the spare loom, use it as a pattern to make a new one. 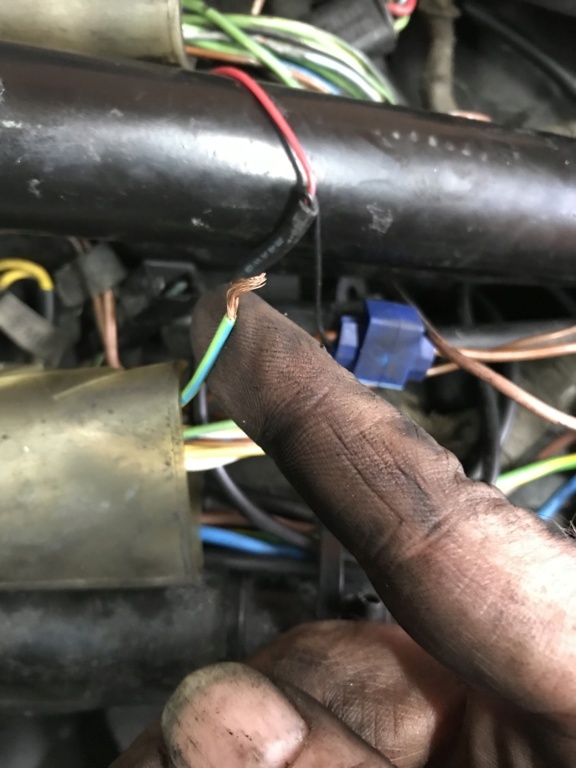 You'll need to use non-OEM connectors (Molex or these: https://www.ebay.co.uk/itm/Cable-Lots-Plug-Multi-Wire-2-3-4-6-Pin-Terminal-Automotive-Connectors-Car-Crimp/273308154831?hash=item3fa26f7bcf:g:n3MAAOSwoj9bKN9K:rk:1 0). The problem with the old loom is that it's thirty-year-old PVC and it will split. @Dai wrote: Rather than split the spare loom, use it as a pattern to make a new one. You'll need to use non-OEM connectors (Molex or these: https://www.ebay.co.uk/itm/Cable-Lots-Plug-Multi-Wire-2-3-4-6-Pin-Terminal-Automotive-Connectors-Car-Crimp/273308154831?hash=item3fa26f7bcf:g:n3MAAOSwoj9bKN9K:rk:1 0). The problem with the old loom is that it's thirty-year-old PVC and it will split. I have a lot of these connectors already. I needed to know how the computers are wired as I do not have plugs for them. I can buy modern wiring which will be sliced into a loom, it may need more plugs than an original loom. I am just not sure if it would be worth me spending so much time on the bike, I have to pay £12.50 per day to ride it in London. I failed miserably to identify a supplier of the AMP ECU connectors and they don't show up on the AMP website either, so I grabbed a couple of cheap and knackered looms off ebay to salvage the terminal blocks. Be very wary of the relays too: BMW used DIN 1 pin layouts but yer off-the-shelf item is DIN 2. When I built new looms for LFB and Brick2 I changed to the DIN 2 standard so that I could get relays anywhere.